Over the last few weeks, I’ve been struggling with a life-long addiction. I am a nail biter… was a nail biter. It’s something that affects millions of people and 45 per cent of teenagers, according to BBC. And although it’s not as serious as some other addictions out there, it’s taken all of my will power to prevent myself from biting my nails. 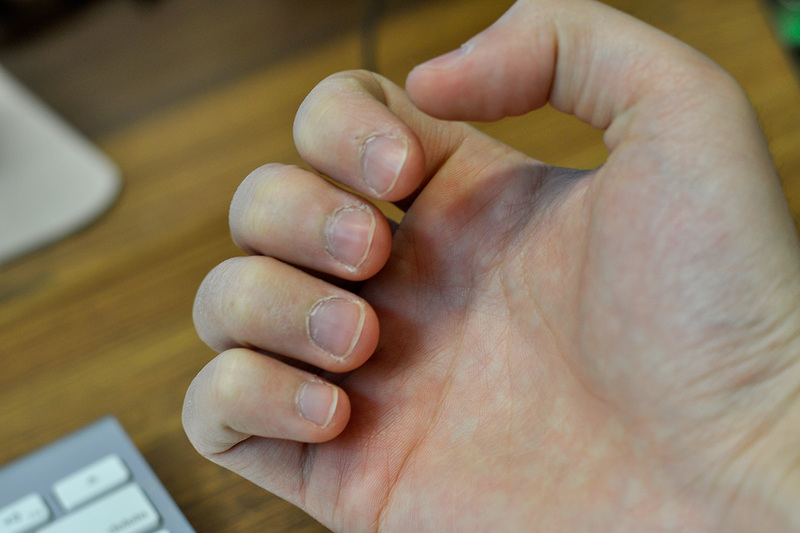 For a long time, nail biting was a kind of therapeutic hobby. It was there when the stress mounted, sadness overwhelmed, and anxiety tittered. It took my mind off of stuff. It was something to do when there was nothing else to do, and in a very strange kind of way I was a way of hurting myself. I make it sound much more melodramatic than it was, but stopping has changed my life in very small, but noticeable, ways. There are certainly reason to stop: health, hygiene, and even the chance to have my first ever manicure! I’ve always wanted to have one, but never had nails long enough to go. And yet there are so many other reason why I made the change and beat an addiction that has destroyed my hands for years. So here are a few tips and tricks I used to stop, and a few of the incentives I gave myself along the way. We all have things we need to do. Whether it’s housework, homework, or just the tasks piling up during the daily grind, and we get them done… sometimes. Do you know what really helps? A reward. Beside the front door of our house, we have a little bench. Toby, our dog, is a funny little miniature poodle, but a big part of his daily routine revolves around treats. There are definitely other pleasures in his life including being the most pampered canines to exist. However, when he’s about to go out for his late night walk, we put a little treat on the bench right before he goes outside. His treats make the most subtle little sound when they hit the bench, but he can hear it. When we put the treat down he does his business fast. When we don’t put it down, he dawdles outside. And during a Canadian winter that’s the last thing anyone wants to do. We’re not dogs, but we are animals and the human brain works in the same way as a miniature poodle’s noodle… wow that sounds gross. Give yourself an incentive, a reward if you don’t bite your nails. I’m not saying you have to treat yourself every time you stop yourself from biting your nails, but maybe have a larger reward ready at the end of a nail-biting-free day. For me, I reward myself by making myself a cup of specialty tea… don’t laugh. It’s not the biggest reward in the world, but I’m strict about it. Days where I’ve bitten my nails, I refuse to taste that sweet herbal tea even at the end of a long, long day. Days where my nails are clean and unbitten, I get tea. It’s as simple as that and I’m starting to run out of tea mothertrucker. Have you ever seen someone biting their nails? It’s kinda disgusting. Protein called keratin harden on your fingers creating a shell around the vulnerable parts of your hands. These nails are great at protecting you, but they’re also little traps for bacteria and dirt. That little piece of black stuff there, yeah that’s dirt and you’re – of your own freewill – putting it into your mouth. Your food hole! Your words pits! Your whatever! However, thinking about this really isn’t enough to stop you from biting your nails. In fact, it may be the reason why some people bite. Maybe by having really, really short nails you can avoid having the dirt build up underneath. But I’ll share with you one of the reasons why I stopped biting. I always bit to the hyponychium. Yep, the hyponychium or that really painful part of your nail you sometimes hit when you bite too far. There was a point in my life where almost all of my fingers were in so much pain that there was no way I could type comfortably. My fingers, luckily, never became infected and I always managed to keep them pretty clean, but the pain I remember. That was many of the tipping points where I knew the nail biting madness had to end. I looked into the mirror and saw a man wincing in pain with short, gnarly, goblinny jagged nails. I stopped to make my fingers look better, to make me feel better, and to help bring some added energy to my writing. There were all too many reasons to stop, but it took reaching a breaking point to finally find the resolve to stop. You’d be surprised how durable nails can be. I can open cans for the first time in my life without having to push down on the little tab first. I can also clean things with my nails including the little spaces in between electronics and, probably to a few people’s disgust, my teeth (always wash under your nails and brush your teeth, kids). The point is, my nails have utility now and I use them once in a while during my day. It makes having them feel worth it and gives me small reasons why I shouldn’t bit them or cut them too short. According to this paper from Yale I just skimmed, nails have two functions: adornment and function. I don’t usually adorn my nails, but I use them more and more every day. When you have little to no use for your nails, your brain might start to think they shouldn’t be there. Open a can using your nails or clean something with your nails or just show off your beautiful nails to the person sitting next to you on the bus, and you’ll have a reason to keep them around. For the longest time, I’ve had really long toe nails. I don’t know why, but sometime during my childhood I suddenly stopped biting those. Maybe I’m just not as flexible as I once was, but the pleasure I get from cutting them with clippers is beyond anything in the world. Seriously, cutting them is how a world-class gardener must feel when he or she finishes slicing up a hedge. However, cutting my finger nails has always been tough. For one, I’ve never had finger nails long enough to cut. The other reason is a small fear that my nail will fall off when put under the clipper’s pressure. Let me assure you they won’t fall off, but there is a technique to it. Then you’re done. Always be sure to leave a little nail left on your finger or you run the risk of getting ingrown finger nails. Let me tell you as someone who had an ingrown toenail once upon a time… it’s grisly and painful. Sometime people think having perfectly curved finger nails are best, but them across to avoid getting ingrown nails. If you still want them to be smooth, use a file. There are still steps I need to take to curb my addiction entirely. For instance, the nail biting has stopped, but the skin around my nails is still being attacked. I also often have to catch myself with a nail in my mouth ready to be bitten. I don’t go as far as slapping my hand out of my mouth, but I take a step back and try to do something else for a little while. For the first time in my life, I can open a tin can using the tab! It’s like having a set of 10 tools always ready at my disposal, yet even as I type on this keyboard I can feel the keratin starting to get a little longer and the nails hitting the keys. I want to bite them, but I take a step back and breathe. There are also other reasons I have to stop biting my nails including a vacation I’ve been promised if I don’t bite my nails. It’s a pretty damn good incentive and I haven’t been to New York in a long, long time. And as someone who loves to pick, prod, and scratch at every pimple, grey hair, and now dirt under my keratin, my nails make this special promise-maker happy. Again, I make it sound a lot more melodramatic than it really is, but you’re trying to stop something you’ve done almost your entire life. What you need to remember is that sometimes change is good and in my case this fruit cup I’m eating right now is pretty damn good. Not perfect, but getting there. This entry was posted in Living and tagged addiction, beating addiction, featured, nail biting. Bookmark the permalink.